Whilst several teams were leading local services today, there was only one team event and so I decided to make that my final visit of Together 2015. The car drive up to Keilder was just stunning and gave me the time I needed to reflect on this last week and to continue to thank God. On arrival at Keilder Castle I was greeted by one of the team leaders who was standing outside inviting everyone and anyone to come to a puppet show. As I entered the castle I could hear the buzz of activity coming from the upstairs room, and it wasn’t long before the puppets were introduced. There’s something wonderful about watching the faces of children as they watch puppets. 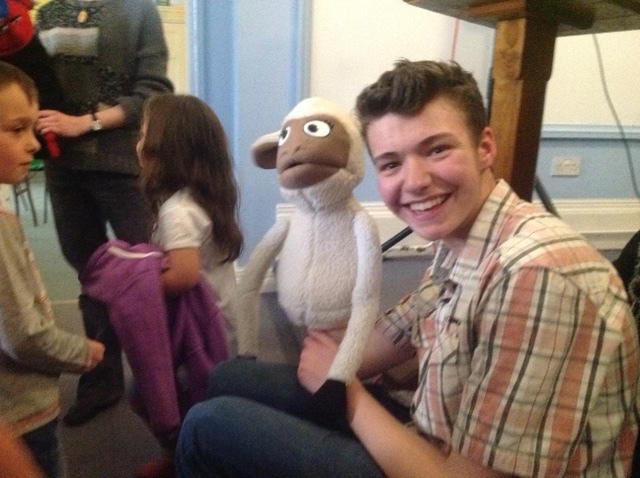 The picture above is of team member James who was part of the puppet team. Then off home, relieved, thankful, and in awe of our amazing God. Thankful also for all the wonderful people have given of themselves to make this happen. So is that the end of Together Missions this year? Pray God NO! Because my hope and prayer is that tomorrow, there will be team members dotted around our region who continue sharing in God’s mission in the workplace, in schools, on the high street and in the supermarket. I pray that the inspirational stories from this week will be shared far and wide and act as both an encouragement and a challenge to other Christians. I pray that the boldness the teams have felt will continue and the offers of a listening ear and a shared prayer will abound. I pray that the demonstration of the love of God through acts of kindness will multiply and the passion to share the Good News will grow and grow. This week, many of us have taken steps in faith because we’ve had others around us to support and encourage us….that’s why we call this initiative Together. But tomorrow, we are still Together, we are still brothers and sisters praying for each other and walking together in faith. And Together, with our faithful God….who knows what might happen?